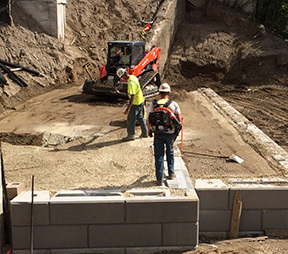 Founded by Matt Barron in 1995, Hardscape Construction is the Twin Cities leader in the design and installation of segmental retaining walls. For more than twenty years we have delighted property owners, developers and general contractors, with the highest quality service, engineering solutions and beautiful earth retention systems. Our experienced people make the difference. With as much as 25 years of industry experience, our foremen have worked for Hardscape for nearly two decades. To further insure the highest quality workmanship, we only use only the best trained, most experienced union tradespeople. Hardscape provides value engineering and design solutions for the most complex applications, including erosion control and watershed management, earth retention, slope stabilization and tall gravity walls. The biggest names in the industry rely on Hardscape to navigate complex projects and difficult schedules. In addition to specializing in large-scale retaining wall construction, Hardscape also installs concrete fences and provides specialized excavation and grading services. We have an outstanding safety record and the latest equipment and tools to deliver exceptional results. Matt Barron partnered with the Gresser family in 2000 to create the Recon Wall System. Large block systems have revolutionized the segmental retaining wall industry over the last 15 years and Hardscape provides the highest quality installations available.